I have been obsessed with Korean BBQ ever since I recently tried it for the first time at Kang Suh in NYC’s Korea Town. Since it’s open 24 hours I get cravings at all hours of the night. My first time, I got Kalbi (short ribs), pork belly, and tongue. It’s cooked by the server on the tabletop grill. Also on the grill was garlic, jalapenos, and kimchi. The meats are complemented by several small side dishes: kimchi, shredded potato, jalapenos, onions, zucchini, rice, dipping sauces, etc. All of which can be mixed and matched, then put into a lettuce cup. We also got a cold buckwheat noodle soup called Naeng Myun with beef, egg, and pear. It was an unusual experience sipping on ice-cold broth, but it still tasted very good. To wash down all this food, I enjoyed hot sake, Hite Korean beer, and Sapporo Japanese beer. On other visits I tried the staple Korean dish, bibimbap. 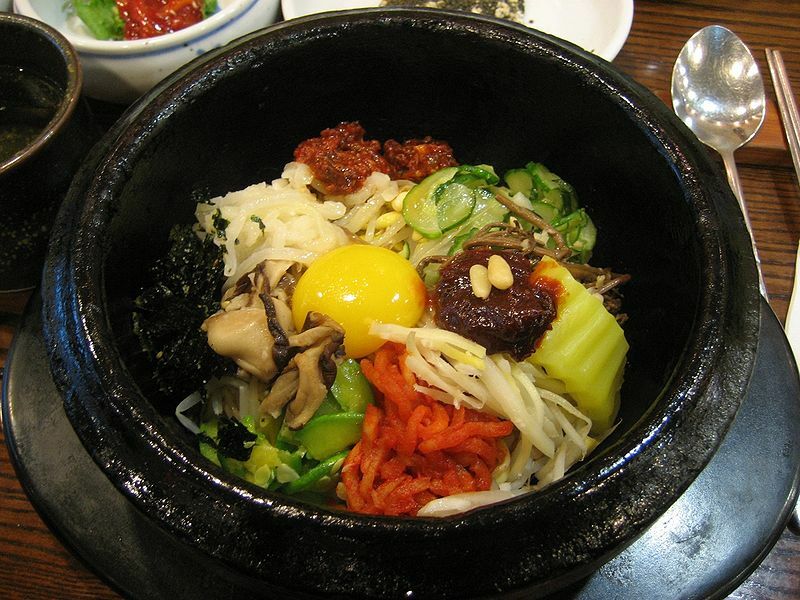 It consists of a bowl of warm rice with mixed seasonal vegetables on top, and a cracked egg. Then chili pepper paste is added and everything gets stirred together for a delicious rice mixture. If you ever get the chance, stop in to Kang Suh. The staff is very welcoming and willing to explain the process to newcomers. It’s worth a visit for lunch, dinner, or even a 4AM post-bar snack. This looks SO good, I am trying it out next weekend!